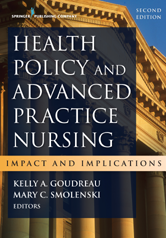 Editor/Author Goudreau, Kelly A. and Smolenski, Mary C.
The only book of its kind, this text offers a wealth of information about the role of all types of APRNs (NPs, CNSs, CNMs, and CRNAs) in influencing the development and application of health care policy in a wide range of specialties. 2. Turning Health Policy Into Practice: Implications for Advanced Practice Registered Nurses - Harris James L.
3. Johnson & Johnson Campaign for Nursing's Future: An Impetus for Change - Smolenski Mary C.
5. Updates on the Implications for Practice: The Consensus Model for APRN Regulation - Goudreau Kelly A. 6. Effective State-Level APRN Leadership in Health Policy - Filipovich Christine C.
7. State Implementation of the APRN Consensus Model: Progress to Date - Goudreau Kelly A. 9. AARP Initiatives - Brassard Andrea and Reinhard Susan C.
10. Million Hearts® - Orsolini Liana and Smolenski Mary C.
11. Value-Based Purchasing and Its Impact on Advanced Practice Nursing - Landin Elizabeth A. 13. Implications of Health Care Reform on Independent Practice - Thiem Laura J. 14. The Affordable Care Act: Primary Care and the Doctor of Nursing Practice - Lathrop Breanna and Hodnicki Donna R.
15. Interface of Policy and Practice in Health Care Reform: What Nurses Can Do to Improve Health Care - Delaney Kathleen R.
18. Health Policy Implications of Genetics and Genomics on Advanced Practice Nursing - Pestka Elizabeth L. and Zanni Karen L.
19. Oncology - Brassil Kelly J., Brydges Garry, Abarado Cynthia, and Dains Joyce E.
27. Health Policy for Advanced Practice Registered Nurses: An International Perspective - Schober Madrean M.
31. What the Future Holds for Clinical Nurse Specialist Practice and Health Policy - Horner Sharon D.
33. Health Care Policy and Certified Registered Nurse Anesthetists: Past, Present, and Future - Zambricki Christine S.
34. Advocacy, Policy, and Politics in Action: A Case in Point—Full Scope of Practice Within the VA Health System - Zambricki Christine S.